Cost to see the Beatles during their first North American tour in Vancouver, Canada on August 22, 1964: $3.50. Cost to see the Beatles during their third North American tour in Memphis, Tennessee on August 19, 1966: $5.50. The chance to travel with the Beatles on all three North American tours: priceless. Bob Bonis worked as road manager for the Beatles on every tour they performed here in America. Brian Epstein, the Beatles’ manager, hired Bonis after a recommendation from The Rolling Stones camp. Bonis had worked with the Stones on their first American tour, and he was probably one of the only people in the world who could get the “bad boys of Britain” to show up for interviews on time. Esptein was looking for someone to take care of the Fab Four on the road, and with his previous experience, Bonis was just the man for the job. Fortunately, for us, Bonis was also an amateur photographer, and his collection of never-before-seen photographs of the Beatles is a fun, casual look at some of the most famous musicians in the world doing some of the most ordinary things. Since Bonis was an amateur, he never tried to capitalize on his collection of photos. It is estimated that Bob Bonis took over 5,000 shots of various musicians with his Leica M3 camera, but he only let a handful be published during his lifetime, preferring not to exploit his friendships with the artists. With his passing (and with the passing of several of his subjects), his son Alex decided it was time the world saw his dad’s work. 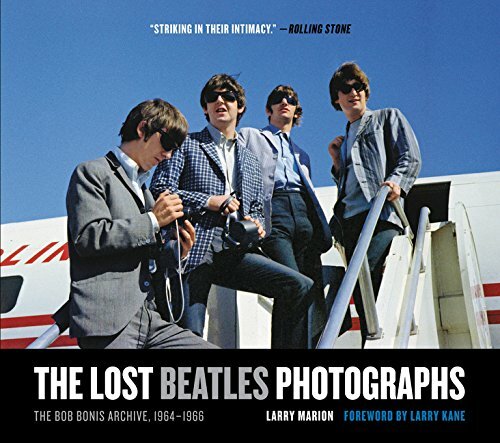 The Lost Beatles Photographs: The Bob Bonis Archives, 1964–1966 is an excellent collection of Bonis’s snapshots, various other memorabilia and ticket stubs, in conjunction with short stories of the bands exploits during their tours. Basically, it is the über-scrapbook that any serious Beatles fan would love to own. Not just fabulously talented musicians, the Beatles also had a solid grasp of British wit and humor, and these casual photos show the lighter side of the Fab Four. We see Paul getting pushed off of a friend’s diving board and into the swimming pool and Ringo playing with a cap gun. These shots are much more fun and real than the standard four-Beatles-on-a-stage-behind-a-mic pictures that are so prevalent. Bonis was privileged to be in possession of THE ultimate backstage pass, and through his photos he can posthumously share the experience with those of us who were not old enough or prescient enough to be at a Beatles show in the sixties. Today, fans have to pay upwards of $75.00 for a ticket to see Paul McCartney live—and he is only one Beatle. Imagine how that math works out. Amanda Mark is a classically trained pianist who studied under Jean-Louis Haguenaeur at Indiana University’s renowned School of Music. She heads the publishing division of Rustic Records in Nashville and works with the Nashville Public Library as a co-founder of the Popmatic Podcast and as a reviewer of various books and music media.